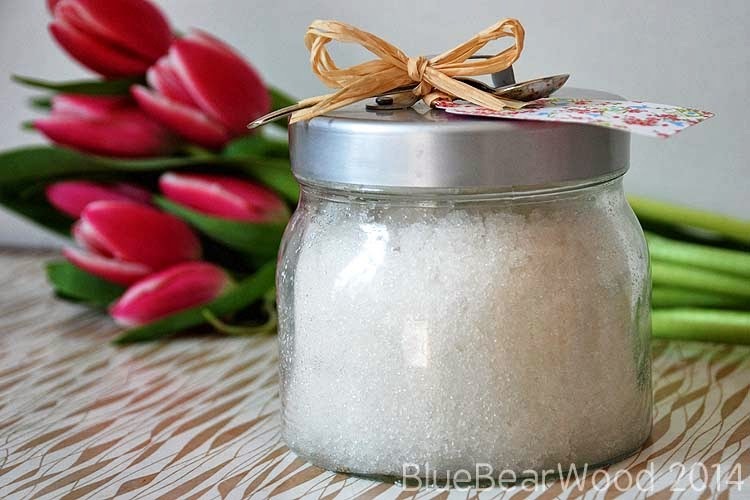 This handmade citrus sugar scrub is super simple and just amazing for moisturising your body. It also makes a wonderful gift for Mothers Day, Fathers Day, Christmas, birthdays or even ‘just-because’ days! In fact a handmade beauty gift can be nicer than a shop bought one. Have a look at this Calendula Bath Soak, Candy Cane Soap, Winter Lip Balm, Sugar Scrub For Men and DIY Pamper Hamper if you don’t believe me. And in case you’re wondering sugar scrubs are not meant to be used with soap. 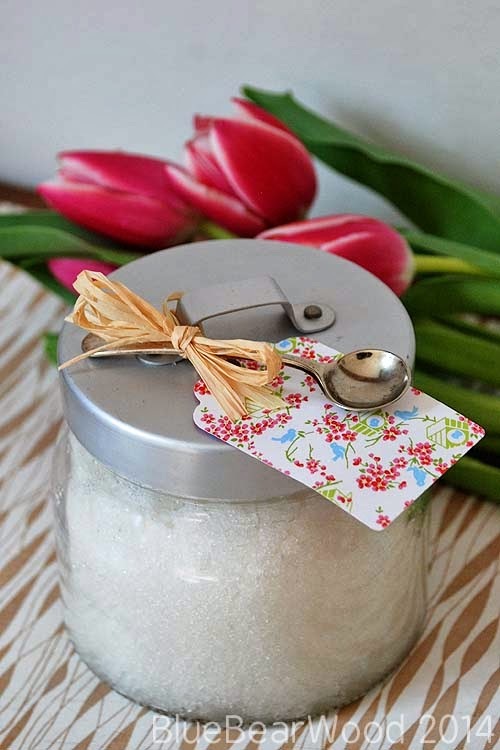 You rub the scrub gently on your body and rinse off allowing the oil layer to stay on your skin leaving you feeling beautifully silky and smooth… and this recipe is an energising morning scrub full of zingy freshness. Back to the Citrus Sugar Scrub. 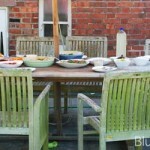 You can adjust these measures to suit your container but for this I used a glass jar from Ikea. 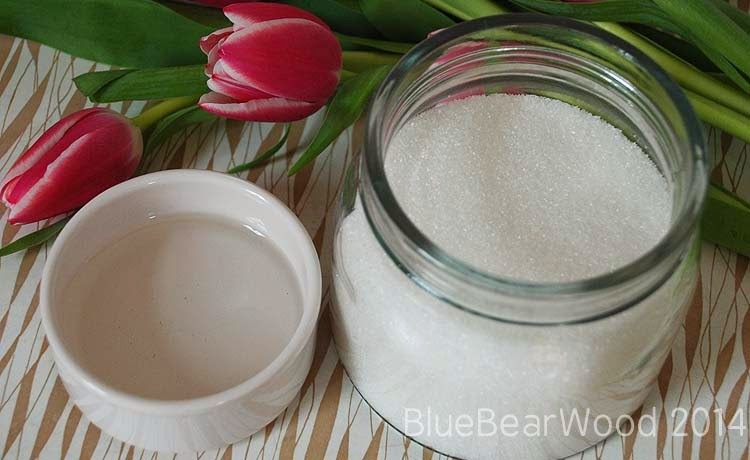 To alter the quantity, fill up your jar with sugar first to work out how much you need and then pour out into a larger bowl to mix. Mix the oil and sugar together until the mixture will hold its shape when squeezed in your hand but will crumble apart when touched. The colour of the sugar will change from bright white to translucent looking. When you have the right consistency add the essential oil drops and mix in well before putting it all carefully into your container. Lots of recipes use large quantities of oil. I think this is a waste as most of the oil gets ashed away. You want to add just enough oil to cover each grain of sugar. This will help protect the sugar from dissolving and also rub the perfect amount of oil over your body. I like to add an old spoon if I’m making it as a gift so that it’s easy to scoop out without getting any water in the container. Once you start making your own scrubs you will never buy them again and they are perfect for children to make with a little help from Dad! Thats so simple, but such a pretty and useful idea. I must give it a go. Great idea and perfect for Mothers day! This recipe sounds great! I’ve been using a 1:1 mix of granulated sugar and vegetable glycerin as a facial scrub for years, so I was very happy to come across this!